No More Mixing 4 Different Powders to Achieve a Good Ayuverdic Hair Wash Anymore- Nzuri Has Already Mixed 6 of the World's Best Ayurverdic Hair Strengthening Powders Reetha, Amla, Shikakai, Neem, Sweet Basil & More! Congratulations on purchasing one of the most important items of any hair care regimen and that is a good root strengthening, ayurvedic hair wash! This product is very unique in that it has taken all of the guesswork out of properly mixing powders for maximum results. Directions: Mix powder to hot water to form a paste. Use 1/4 cup of hot water to 4 TBSP of powder. Mix. You may have to add more or less powder or water to get it to a paste where you can apply it with your fingers or a brush applicator without drip. For natural Afro American hair, since black hair is prone to dryness you will need to use the Nzuri conditioner or whatever conditioner you have after you rinse out powder to restore moisture to tresses. This is not a moisturizing treatment but a hair cleanser and strengthening treatment that will restore strength to your hair and scalp which probably has been damaged or altered from years of chemical relaxers, perms and hair color.This hair wash powder is a hair cleanser so you do not need to shampoo after use. It takes the place of regular shampoo and can be alternated between your shampoos. It acts like a clarifying shampoo in that it will remove the buildup of other hair products.Your hair will be tensile strong with regular use. You should notice a different in hair strength from the first application. With regular use (at least 2 times a month) until your hair is as strong as you like and then once a month may be sufficient. For non Afro hair or hair that is shedding excessively you may use this powder once a week. It is safe to use as often as needed. Afro hair may use often as well just moisturize hair with a moisturizer or deep moisture treatment.For extra deep conditioning you may apply the Nzuri Stop Hair Loss oil or Hair Follicle Food 61 to hair first and then apply hair wash powder on top of oil. Leave in hair for at least 2 hours or overnight. Be sure to cover hair with plastic cap. Guranteed highest quality Ayurverdic Powders: Ayuverdic Reetha. Amla, Shikakai, Bhingraj, Neem, Sweet Basil & More and is guaranteed to stop hair shedding and hair fall on the first use. Don't be fooled by lesser quality. Don't waste your hard earned money on cheap copies. This is the highest quality, pre mixed ayuverdic powders on the market. See Extended information tab. What is Ayurveda? The National Center for Complementary and Alternative Medicine identifies Ayurveda as one of the oldest systems of medicine on Earth. In India--Ayurveda's place of origin--these ancient healing techniques are still used by more than 80 percent of the population. In the Western world, where practitioners classify Ayurveda as a form of alternative medicine, the herbs used in the practice are steadily gaining popularity. Early scientific evidence supports many of the traditional uses associated with Ayurvedic herbs. Ayurvedic treatments can be time consuming, but the rewards outweigh the time commitment and one must use great care with measurements, when using Ayurverdic powders. There is a lot of information out there on how to mix these powders. The problem is that 99% of the information doesn't give the correct way to mix these powders. Ayurverdic is a serious form of hair care and should be treated as such. Also, why spend time trying to mix the right powders when it’s all been done for you? Nzuri Herbal Hair Wash is already mixed with 4 of the top ayurverdic herbs in the best most effective combination possible. This product is made from the highest grade of ayurverdic powders: Ayuverdic Reetha. Amla, Shikakai,Neem, Sweet Basil & More and is guaranteed to stop hair shedding and hair fall on the first use. Nzuri herbal hair wash is a unique combination of all natural herbs, fruits and flowers. All of these natural ingredients contribute to keeping hair & scalp clean, promote hair growth & deeply nourish hair roots. Nzuri herbal hair wash powder cleans the scalp without stripping hair and scalp of its natural oils. Regular use will give your hair maximum strength & prevent breakage. It is extremely mild & beneficial for those who have sensitive skin. Free from any chemicals or preservatives it is especially good for those who suffer allergies from chemicals which are present in soaps & shampoos. It is also very good for previously chemically treated or currently chemically treated hair because chemicals cause a lot of wear and tear on the hair follicles, roots and strands. This strengthener is a great way to restore hair to it’s natural Ph balance and health. Natural Hair: If your hair is natural, you know that the little round fuzzy balls that fall off constantly can really add up. Let’s face it, how can your hair be on the ground and in your head at the same time? It simply cannot. That is why you have to use measures/products to keep your hair on your head. Length retention is one of the biggest complaints of naturals. Let the Nzuri "Hair Rescue" rescue your hair from unnecessary breakage. Nzuri hair wash powder helps cleanse hair naturally with herbs and helps promote hair growth, imparts shine and deeply nourish hair roots. Caucasion hair or Relaxed African Hair: this product will help to greatly minimize the amount of hair you shed in the shower or lose in the comb. Nzuri Natural Herbal Hair Wash helps cleanse hair naturally with a unique combination of Ayuverdic herbs, fruits and flowers. All of them contribute to keeping hair & scalp clean, promote hair growth & deeply nourish hair from roots to tips. 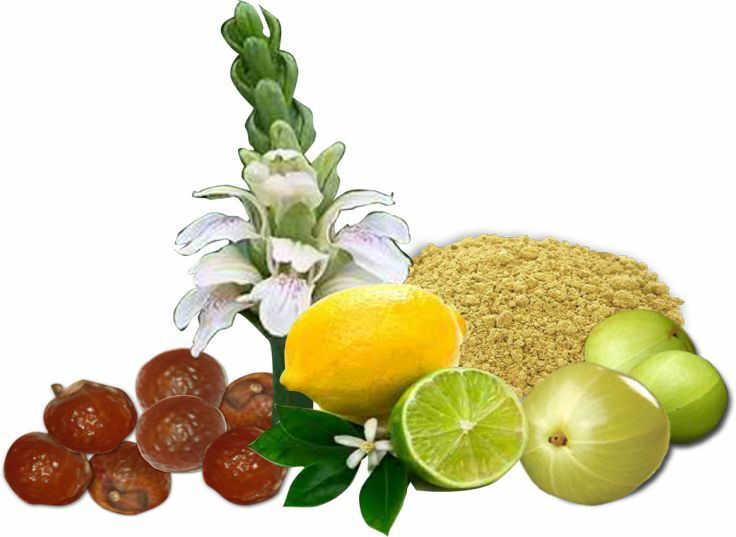 Reetha or the Indian soap nut is a natural cleanser. It has been used for centuries in India for bathing & washing hair. Shikakai is a natural hair conditioner. Amla gives gloss & shine to hair & strengthens hair roots. Bhringaraj, which means the King of Hair in Sanskrit, keeps the scalp cool & prevents hair fall. Lemon is a natural cleanser. Hibiscus is a natural hair conditioner & promotes hair growth. Jamun is anti-bacterial & has a cooling effect on the scalp preventing hair loss due to heat build up. Mango works as an astringent; it is also anti-bacterial & cools the scalp. Stop Shedding 1st Wash Guaranteed! Made my hair stronger also seen quite a bit of new growth right after 1st use....will buy atleats 4 more after I'm finished with the 2 I have. I am a repeat customer of Nzuri and I've bought several items from Nzuri in the past. I learned of this company after Dr. Nina Ellis-Hervey mentioned Nzuri's hair growth challenge. I tried the Herbal Hair Wash Powder as I was concerned about hair shedding. I applied it as the tutorial video instructed (big help!) and I experienced ZERO, zilch, nada - no hair shedding! None in the bath tub, towel....I was amazed. I have since purchased another package. This is well worth the price...take my word...Get It!! I bought this for my daughter who relaxes her hair and is experiencing shedding; the wash powder did lessen the shedding, will have to continue using. This is one of the best ayurvedic powders I've used and I use a lot. I mean although I am not Indian my friends tease me because of my facsination with these powders. Now I have to admit that this saves me a lot of mess and money. But, my hair was dry afterwards. Then when I called and spoke to you all your Hair Genie #3 Rep told me I was supposed to use your conditioner or a deep conditioner in there to restore the moisture b/c basically this hair was cleared away all the product build up (which I most certainly appreciated). My point is that your directions did not say to deep condition. Some people may not call in and just get frustrated. I want to say that after I did condition it my hair is the B.O.M.B. It is strong enough to pull a truck! Almost no shedding and that was my biggest concern. So I would have given this a 5 star except that I want to get your attention to tell us about the conditioning afterwards.